My father was a dentist. Despite this he was a lovely, kind and gentle person but it has to be said he had a professional dislike of sugar. We weren't allowed any. At all. No cakes, no lollies, no desserts. I don't think I'd even tasted fairy floss until I was in my late teens. Of course, as is the way with forbidden fruits, that only served to make sweet things all the more attractive and when I was away from parental control I had no control. As with so many things in life, there's something to be said for everything in moderation, even fairy floss. 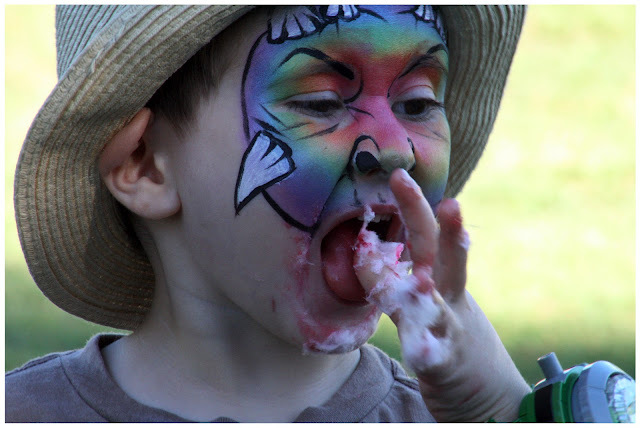 Let's face it, at least nutritionally, there is very little to recommend fairy floss but that blend of sugar and food colouring has a huge appeal. I just love the way this little bloke was getting into it at the Home Festival at Kangaroo Point today. The festival had a strong environmental and community flavour and there was quite a lot of emphasis on "good" food. Want a smoothie? Well jump on a push bike and power the blender. Try some raw food, or whole food or organic food. Or tuck in to the fairy floss. It is finger licking good. Very good. That's a very sophisticated application of face paint too. Amazing photo! Love it & could just eat some candy floss! I have never really liked candy floss it is a really overindulgent sugary treat but my son loves it. Love the face paint, that is really amazing! This pic says everything summer should- fun in the sun! Wonderful. Nowt like candy floss, he looks like he's really enjoying it.